Five years in the making, the King Kong musical, produced by Australia’s Global Creatures, has opened to thrilled and awed audiences in Melbourne at Australia’s Regent Theatre. The star of the show is undoubtedly the six metre, one tonne King Kong puppet, designed by Global Creature Technology. Contracted by Production Resource Group, L.L.C., (PRG), Stage Technologies teams in the UK, the US and Australia worked closely with Global Creature Technology to supply the ground-breaking automation system which controls the eponymous ape. The automation package includes over 12 tonnes of steelwork, motors, winches, and cable management systems, which give the Kong puppet its sweeping movements; enable it to lift and rotate; and allow it to travel up, down and across the stage. The on-board winches control the height and rotation of the body, and allow Kong to fly in, leap, gallop, stand, etc. Sharp-eyed audience members will notice the three lines on each of the Kong puppet’s shoulders. Multiple lines bridle down to each shoulder, giving them independent up and down movement and manoeuvring Kong forwards and backwards within the space of the apparatus. Optional lines can also be connected to Kong’s posterior or tummy to allow the body to be rolled in either direction. 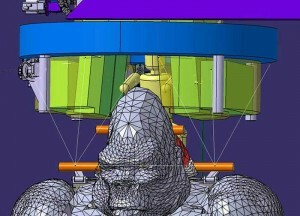 In addition to the winch apparatus, two point hoists have been built into the false proscenium, which bring the ape directly to the front of the stage where he roars out at the house. Using the Sculptor toolkit (a proprietary plugin for 3ds Max), Stage Technologies worked closely with the creative team to mock up a pre-visualisation that would serve to visually communicate the puppet’s movements to the various production departments. Then, a relatively simple "baseline" plot for motion was programmed into the Acrobat desk, to which the puppeteers could add live embellishments and react in real time with the actors on the stage. The resulting ‘overlaid’ joystick control greatly simplified the plotting process, and ensured that the automation team could react to the subtle nuances of the human actors without a massive impact or the necessity of replotting during valuable technical rehearsal time. Thus the show requires an extraordinary amount of collaboration between the entire team of Kong operators: Kings Men (manual manipulation of Kong’s arms and legs), voodoo rig operators (aka animatronic puppeteers), and the automation team who run the Stage Technologies system. In working this way the show achieves an unprecedented six degrees of motion, via the overlay of live animatronics performed by the puppeteers on top of the pre-programmed automation paths. The integration between operators is further enhanced by allowing the Voodoo rig operators to take limited control of the Stage Technologies winches and manually manipulate the pre-programmed paths which are already being run by the automation team. In this way the voodoo rig operators offset live running moves, allowing a more natural flow to the motion. This offset is scalable and can be faded in and out per cue or live during a cue. In the interest of collision avoidance, the buck stops with the automation team, who can shut down the voodoo riggers’ ability to offset the pre-programmed paths in an emergency. 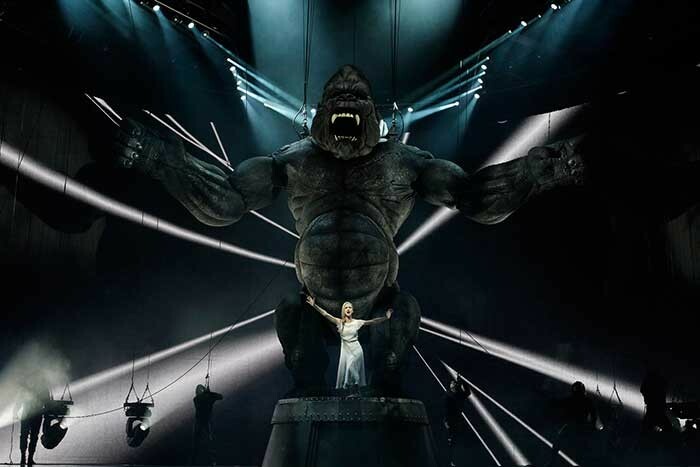 King Kong is a break-through in automation control, allowing the puppeteering of large scenic elements whilst retaining the full control and safety systems within the automation system.